Topkapı’s Harem, the section devoted to women that conjures up images of intrigues, corridors, dark rooms and overcrowding, has always been a mystery throughout history. A new book by Professor Nurhan Atasoy, with the simple title 'Harem,' opens a new window on the quarters’ history and its cultural significance during the period of the Ottoman Empire. The book is filled with beautiful, colored photographs of rooms and decorations of this part of the center of the Ottoman Empire, which has generated so many rumors and stories over the centuries. The color reproduction is so good, readers feel like they can reach out and touch the real thing. Moreover, the captions on the photos are extensive, providing a chance for readers to learn so much more about the section simply by reading them. Intertwined with the photos are Orientalist paintings from the 19th century and engravings from earlier times. Atasoy has also included photos of children and women’s clothing that were stored in the palace depots, pointing out when each style was popular. There are also pictures of the stunning jewelry that adorned the women. The text in English is presented in a readable style and contains background as well as anecdotes, both known and unknown. The reader is not just introduced to the buildings but also to how the rooms were used, as well as many of the customs of the time. Atasoy makes clear where we know something to be true and where it is just speculation. 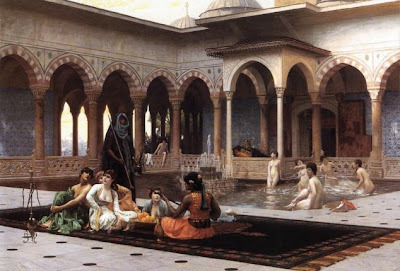 After all, many of what are supposed facts about life in the Harem were dreamed up by foreigners who never entered the place, let alone lived there or interviewed any of its inhabitants.